5. EX Digimat-AM – Attention, Pros! ideaMaker is a user-friendly slicer software produced by Raise3D. Although it’s mainly made for Raise3D’s 3D printers, it’s also possible to configure ideaMaker to work with any other FDM 3D printer. With ideaMaker at your disposal, you’re able to play around with a lot of print settings. What we find to be especially cool is the ability to manually add and remove supports. All slicers generate supports automatically, but ideaMaker gives its users a level-up in freedom with this feature. Within the G-code simulator, it’s possible to display different types of lines and structures in different colors, as pictured above. One cool feature of ideaMaker is that it calculates how much the material for a certain 3D print will approximately cost. This is an especially handy feature for anyone running a 3D printing service. Lastly, ideaMaker has a beautiful user interface, which simply makes it a pleasure to work with. With the ability to manually remove and add supports, view layer simulations, and calculate prices, not much can beat ideaMaker. 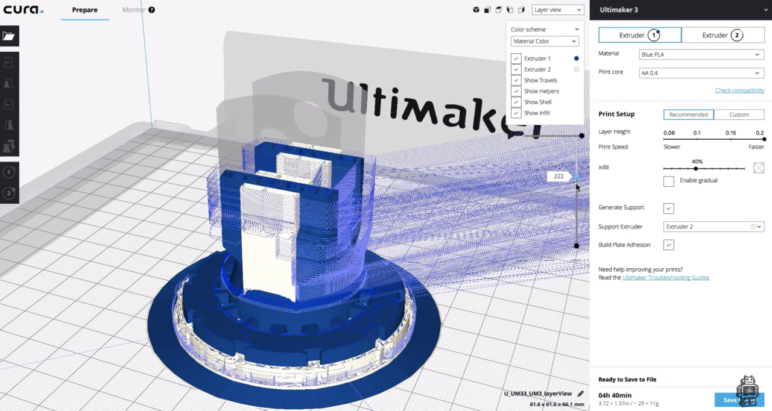 Ultimaker’s Cura is arguably the most well-known slicer software out there. Naturally, Ultimaker made Cura mainly for its own 3D printers, but it works nicely with many other printers. Most people love using Cura, and for good reason. The user interface is quite responsive and easy to interact with. One of the biggest specialties of Cura is the pure amount of settings you’re able to play around with. To be honest, most home users probably won’t ever use half of what’s possible, but it’s very appealing for professionals. In the G-code simulator, Cura displays different movement and structure types in different colors and gives the users the ability to choose which lines and structures they want to preview or not. 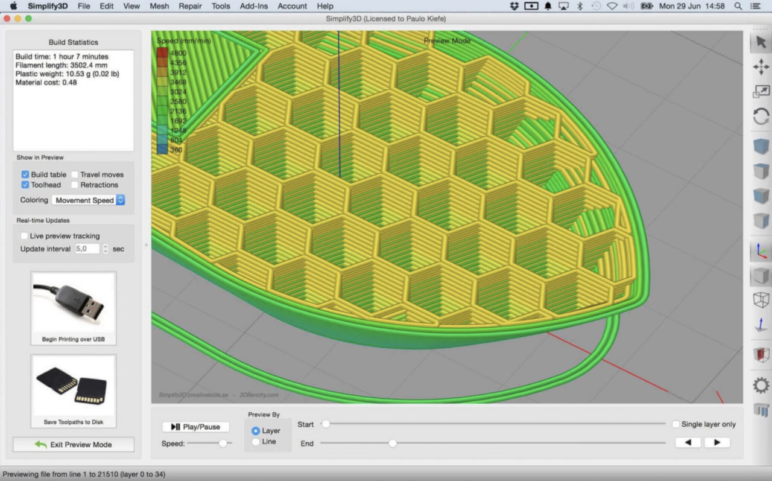 Cura also offers the ability to lock a certain number of layers together and move alongside the part’s layers within the desired layer number interval. 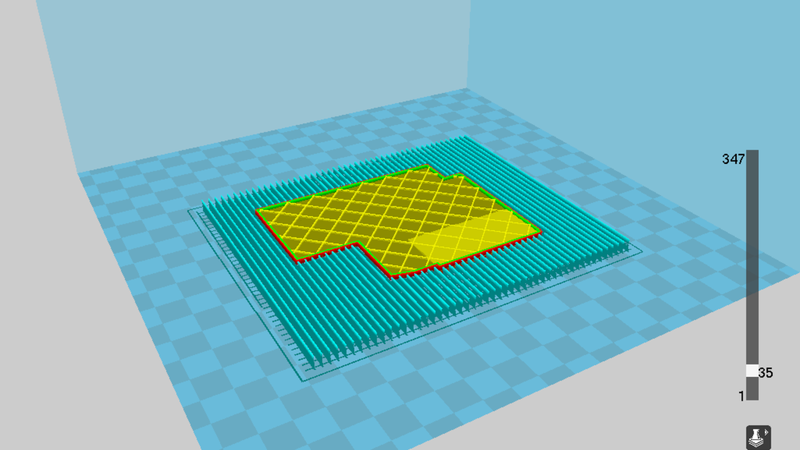 In Cura, it’s possible to manually add supports in addition to those automatically generated. However, it’s slightly more complicated than doing so in ideaMaker from Raise3D. Slic3r is a powerful free slicing software and G-code simulator. A few years back, Slic3r joined forces with the famous 3D printer manufacturer Josef Prusa to produce the Slic3r Prusa Edition, an improved version of the already existing Slic3r software. Despite its name, the slicer is compatible with almost every FDM 3D printer since users can create custom printer profiles. 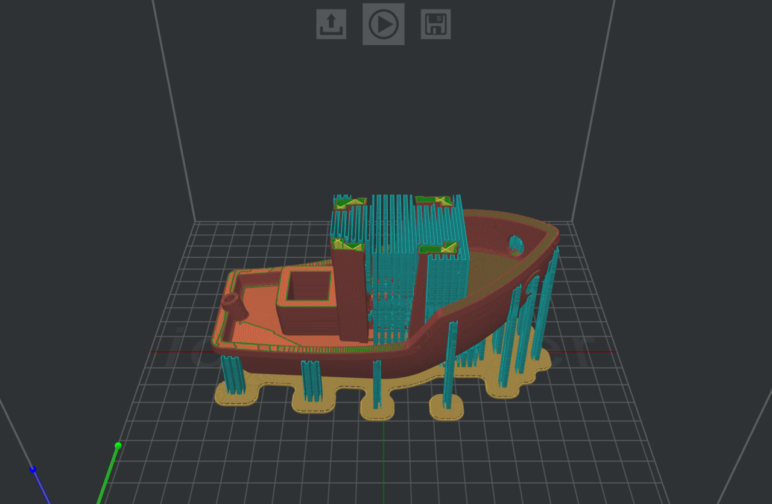 Slic3r Prusa Edition contains a lot of great settings you can freely configure, but one of the coolest features is the ability to vary layer heights. This is a particularly useful feature for prototyping since it enables certain areas of the part to be printed quicker and in less detail. The user interface is nicely organised, but in our opinion, lacks a bit of modern design. However, everything works just as it should. The outer and inner layers, supports and infill are all colored to clearly show the difference between them. Unfortunately, you can’t add or remove supports manually with the Slic3r Prusa Edition, nor are there print time and filament usage estimates. 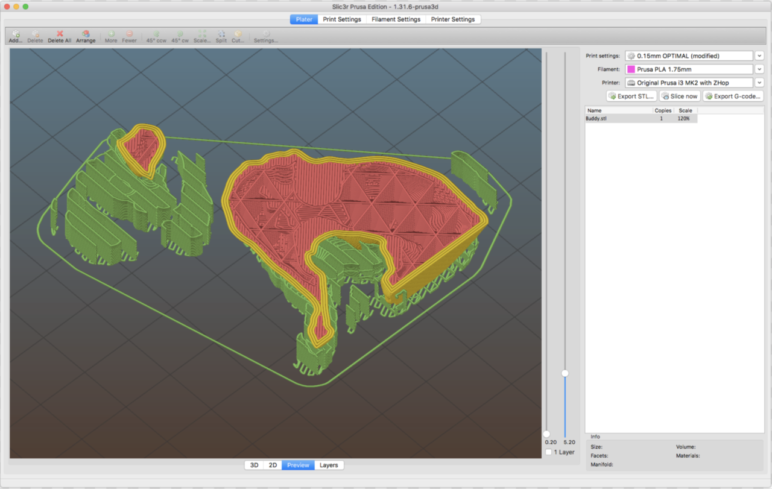 Nonetheless, it is a solid 3D slicing software with a useful G-code simulator. Simplify3D is a paid slicer software, aimed mainly towards professionals, but also towards hobbyist who can afford it. As you’d expect from a paid software, which is praised by many, it offers a huge amount of settings for the user to tweak and play with. Experts always aim towards achieving the lowest cost per print possible. Therefore, a feature worth pointing out is the ability to experiment with how different settings affect the print time and material usage, before exectuing the print. Every line type or structure you can possibly think of is nicely indicated by a unique color. The dual-slider option offers a single layer viewing mode, which allows the users to view the printing process layer by layer without seeing previous layers. Apart from that, it’s also possible to view print head travel movements. When combined with advanced settings in Simplify3D, viewing print head travel movements is a powerful tool for identifying where unpleasant stringing may occur. It also offers a play/pause button that allows for a true time-lapsed simulation of the print. Simplify3D is capable of remembering all your different settings profiles so you can easily switch between them and experiment with print times, material usage, and other settings. G-Code Simulator 5. EX Digimat-AM – Attention, Pros! This professional software is a bit different from the rest and is not accessible to the general public. Nevertheless, it’s perfect for large design companies. Digimat-AM is a professional G-code simulator made by e-Xstream engineering. 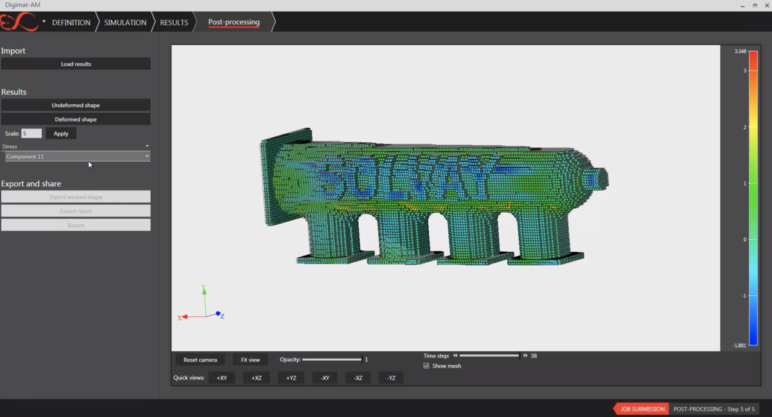 Using Digimat-AM it’s possible to simulate either FDM or SLS 3D printing processes. Its main purpose is to help the designers and engineers identify manufacturing issues that may occur during additive manufacturing processes. In the spaces of industrial 3D printing, efficiency in time, cost and part performance is hugely important. That’s exactly what Digimat-AM helps the professionals achieve. The software is capable of calculating and displaying a ton of information. 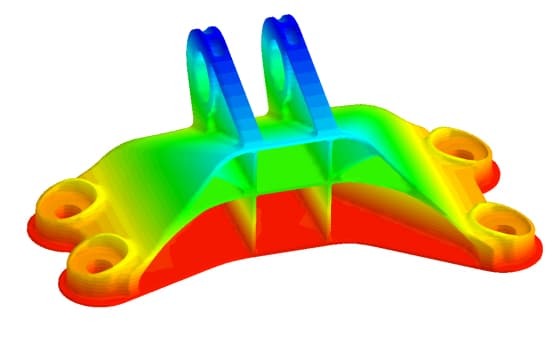 For example, professionals may want to use Digimat-AM for displaying and simulating various structural stresses and temperatures during the manufacturing process. We’d also like to point out the ability of Digimat-AM to create graphs from the data based on the simulations, which is a valuable feature for professionals. If you’re interested in Digimat-AM, you can request a quote. 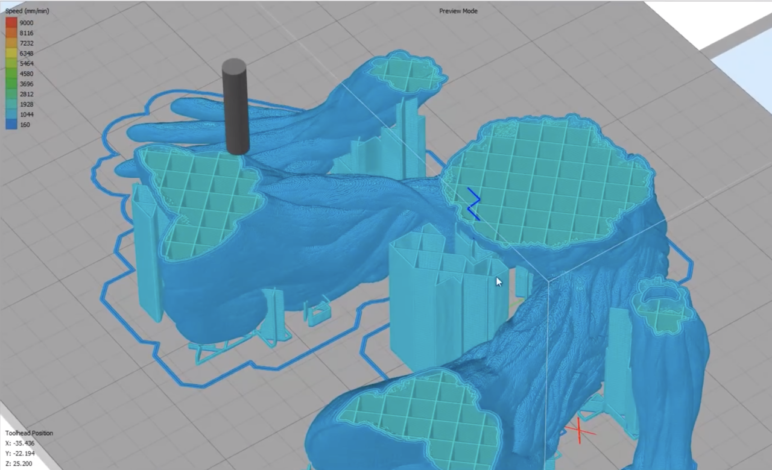 License: The text of "G-Code Simulator/Viewer – 5 Best Tools to Simulate 3D Printing" by All3DP is licensed under a Creative Commons Attribution 4.0 International License.